Now at the special price of $5900 (normally $6250)! Book in for your Smilefast consultation, call (03) 9826 5058! Smilefast is an advanced new orthodontic system available to our adult patients who are seeking a beautiful smile without spending years wearing traditional braces. Forget about wearing big metal braces and costly treatment that takes two or three years. Smilefast is designed to fit your lifestyle and give you a beautiful, confident and affordable smile – fast! Traditional braces can change the entire bite. Smilefast primarily addresses the front teeth that show when you smile. Because of this, the treatment can progress much more quickly than contemporary orthodontic treatments. What are the Benefits of Smilefast Adult Braces? Magic Braces use tooth colored materials that allow the orthodontic appliances to blend right in with your teeth, making it more difficult for other people to notice. If you’ve decided against braces because you were told treatment could last 24 months or longer, then Smilefast could be the perfect choice. Because every patient’s needs are unique, it’s important that Dr. Pohl examine your teeth to determine whether or not you’re a candidate for Smilefast braces. Existing gum disease and tooth decay should be addressed first. After your initial consultation, Dr. Pohl will be able to provide you with an estimate of how long your treatment may take as well as the cost. Smilefast combines traditional techniques with the latest in orthodontic technology to allow us to cosmetically align your teeth rapidly, yet safely. With a focus on the cosmetic alignment and improvement of your smile, our exclusive and revolutionary Smilefast technology has allowed us to achieve fantastic results in around only 6 months. While 6 months is the average treatment time, some patients finish in 3-4 months while more complex cases can take up to 9 months. Q. Do I Have To Wear Big Metal Braces? We understand that many patients are concerned with the appearance of metal braces – perceived to be big, chunky and highly visible. With Smilefast you do not have to wear metal braces. 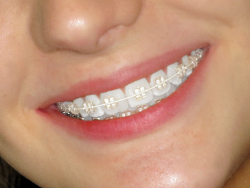 We use very discrete clear braces on your teeth. Smilefast are almost invisible as they blend seamlessly with your teeth so people won’t even know you’re wearing them. Q. Are The Wires White Or Metal? Smilefast uses special white-coated wires that are far more discreet than regular metal wires. White-coated wires are as effective in straightening your teeth as metal wires, they just have the extra benefit of being more discreet! Q. Do The Clear Brackets Discolour? The clear brackets will never discolour. The tiny elastic rings that are placed around the bracket can however occasionally discolour if the patient regularly consumes heavily coloured food and drinks, such as coffee and red wine. However these rings are changed at each visit so that your braces remain clear. Because Smilefast treatment is completed far sooner than other orthodontic treatment, it means patients endure fewer visits and therefore is less expensive. Your Smilefast provider understands that costs are often a barrier for some which is why many providers also offer flexible payment plans. These plans help ease the financial pressure and get you on your way to your new smile as soon as possible. Q. Smilefast Vs. Clear Aligners – Which Is For Me? Smilefast is designed to quickly, yet safely, address these concerns leaving you with a great smile in months, not years. Stop hiding your smile and speak to your Smilefast provider today about getting you started on your new smile – that’s only a few short months away! Want to know what Smilefast can do for you? Book your Smilefast consultation as part of your preventive care appointment with Dr. Pohl today!